ComplianceOnline Medical Device Summit 2018 will bring together current and former FDA office bearers, FBI officials, regulators, industry veterans and policy influencers as well as several distinguished CEOs, board directors and government officials. 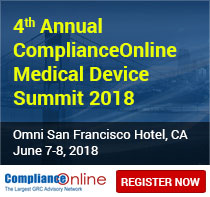 ComplianceOnline, the leading governance, risk and compliance advisory network with over 1500 experts in various regulatory subjects has announced its 4th Annual Medical Device Summit 2018 speaker lineup. The Summit will take place on June 7 and 8, 2018 at the Omni San Francisco Hotel in CA. The two-day event will feature 4 Keynotes, 12 impactful track sessions, 4 stimulating panel discussions and over 300 minutes of networking. This annual summit brings together current and former FDA office bearers, FBI officials, Editor in Chief at FDA Information Repository - IRAI, industry and regulatory specialists from around the world to address key issues in compliance, quality and innovation. -- President and Chief Scientist, HirLan, Inc.